World Hypertension Day was set up to highlight the health issues associated with high blood pressure for example greater vulnerability to preventable stroke, heart and kidney diseases. High blood pressure affects 1 in 3 people but almost 50% of people don’t realise that they have the condition. This is particularly worrying because hypertension causes 62% of all strokes and 49% of heart disease cases. If you any combination of these symptoms or think you may have high blood pressure it is important to consult your doctor. A complementary approach to the treatment of high blood pressure is Hypnotension ©. The Hypnotension approach aims to help anyone with primary/essential hypertension to lower their blood pressure naturally. The treatment puts the client back in control by identifying and addressing the lifestyle factors that contribute to hypertension. Each client is assessed and a treatment plan devised to effectively address the factors that contribute to the client’s high blood pressure. You can find Hypnotension practitioners in the UK, Australia and many other countries. Sleep – why is it so important? This weekend in the United Kingdom, we moved to British Summer Time and lost an hour’s sleep. I’ve blogged about sleep a lot but I’m not apologising – it’s important. I run courses designed to help people overcome sleep problems and when I mention this to other people I can guarantee that they say “I wish I could come on that” which just shows how common sleep issues are. Common problems are short or interrupted sleep and these can be caused by a variety of issues such as stress, life events, environmental factors and medication. Adults sleep on average about 7 hours a night and this can become less as we grow older. This is much less than people slept in pre-industrial, pre-electric lighting times. Prolonged periods of short or interrupted sleep can lead to physical and mental health problems. One problem relates to weight control. Lack of sleep elevates the creation of the hormone ghrelin*. This forces up the consumption of carbohydrate by up to 35-40% which can lead to weight gain. Individuals with restricted sleep tend to be heavier. Poor sleep can also affect the immune system. Natural killer cell activity is down by 28% after one night’s disrupted sleep. Levels of cancer are higher in people with disrupted sleep and shift workers. A study of medical students in America, who work long and irregular hours, have shown that it impairs performance and can lead to accidents at work and at home. There are some simple things you can do to get a better night’s sleep. Start with your bedroom environment and make your bedroom a sleep haven. Make sure your bedroom is cool, dark and well ventilated. Remove the TV and computer from the bedroom. If it is worry or stress that is keeping you awake, there are lots of techniques that you can learn to use such as breathing techniques, visualisation and meditation. Consider seeing a hypnotherapist for some help. 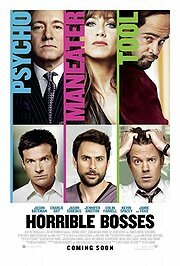 The recently released comedy film, Horrible Bosses, proposes an extreme solution for dealing with a boss who bullies you, makes sexual advances or is just incompetent. The three friends coping with these horrible bosses are unable to quit their jobs so theyplot to kill them. Inevitably their plans go wrong but, being a movie, it all truns out well in the end. If you are having problems with your manager at work, you’re not alone. In a survey by MIND earlier in the year, respondents identified work as their highest source of stress and 48% were scared to take time off sick. 20% believed that if they mentioned their stress levels to their boss they would be first in line for redundancy. So what can you do? If you are being bullied, you should check your company’y policies on bullying in the workplace. Is there a Trade Union or Staff Association that you can consult? Is there a welfare officer that you can talk to in confidence. If you are strating to get symptoms of stress (eg palpitations, higher blood pressure, poor sleep, loss of appetite etc) you may need to talk to your doctor or another health professional. For some people, when they think about their boss, they hear their voice loud and close to them making derogatory remarks. If you experience that, move that voice further away by reaching out your arm and putting the voice at the tip of your thumb. For extra effect change the sound of the voice to Mickey Mouse – it will definitely feel less serious!